One of the greatest trends and most feminine one of this moment is without doubt the peplum, that cute little overskirt, sprouting from the hips on tops, skirts, dresses and blazers. The peplum is everywhere nowadays, it gives you the perfect silhoutte, creates a small waistline, add some feminine volume to your hips. The actual term "peplum" comes from the Greek word for shawl, "peplos". In modern fashion, peplums began drawing peoples attention around 1947, when it was Cristian Dior who presented this New Look silhoutte and changed fashion forever with these nipped-waists, peplums and full skirts to accentuate the feminine hourglass figure. I think this silhoutte is absolutely fabulous and you can see in my previous post who I wear this shape. What do you think? Below some real peplum inspiration, enjoy! amazing photos & nice blog! Okay I'm drooling (lol gross). But seriously, I can't believe I don't own one of these beautiful peplums. Peplums are pretty hard to wear, I think, but I love the second picture! Very sleek. I love the peplum trend! Followed you on Bloglovin too(number 259)! Christiand Dior´s new look what such ahead of his time that it longs until nowadays and I´m so glad because new look makes women feel and look so femenin and beautiful. I´m such a fan that I have one Davidelfin dress with peplums and it´s my favourite dress! I love peplum but I have never bought it, I'll do! THERE IS DEFINITELY NO SHORTAGE OF PEPLUMS RIGHT NOW..GREAT PHOTOS..ESPECIALLY THE SECOND ONE WITH THE LEOPARD PRINT..AMAZING! This post is amazing! 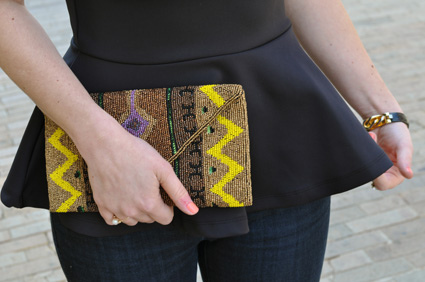 Peplum is my favorite trend of the moment! Gorgeous photos. Yes i love it ! Really great peplums! Will follow you to with bloglovin! Great inspirational post, love this new trend and your blog is stunning! Btw thanks so much for the lovely comment on my blog, I just followed you, hope you did the same! I'm not a very big fan of the peplum for myself, but I do enjoy seeing it on others! Lovely collection of photographs! Thanks for following me on bloglovin, I just followed you back! Keep up the great work! I love the peplum trend! Great photos you've picked! Amazing post I really love peplums...regards...!! !